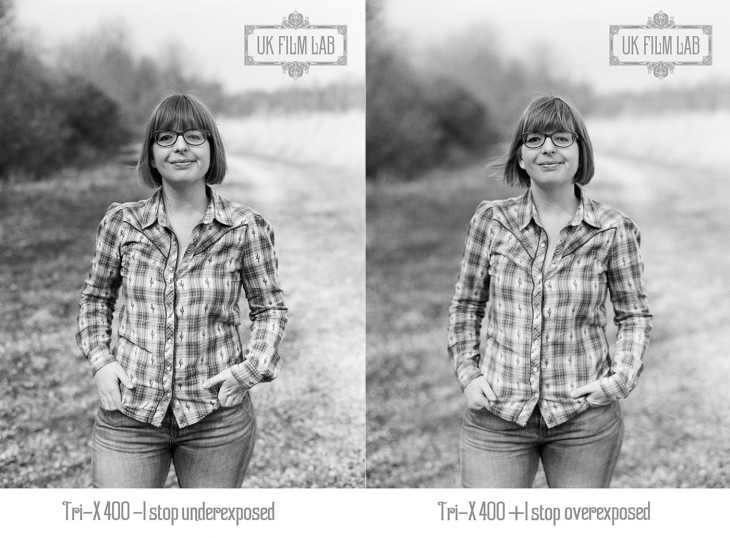 Following on from our film stock and exposure comparison of the major Kodak and Fuji film stocks we have produced a guide showing you the difference that exposure makes to Kodak TRI-X 400 black and white film. Just as before, for the full details on how we carried out the test please see the end of the blog post, and to see larger versions of any of the images, just click on them. After the images you’ll find our detailed and comprehensive recommendations for exposing black and white film, based on the results of this test. This first trio of images compares three stops of underexposure (left hand image*) to box speed (middle image) to three stops of overexposure (right hand image). As you can see, compared to the underexposed image, the box speed image shows much better tonal transition; softer, more detailed shadows; and smoother grain. These characteristics are also displayed in the image overexposed three stops, but as you will read later, there are detrimental effects if viewing the image larger/more closely. *The difference in appearance between these images is also associated with the narrower aperture of the underexposed image. These close-up details show the effect of exposure on the appearance of black & white film in terms of shadow detail and grain. Note that the box speed image is the most acceptable overall: not quite as much shadow detail as the very overexposed image but a much more pleasing appearance of grain. The very underexposed image has poor shadow detail and unpleasant grain. Once again, we wanted the comparison to be as direct as possible so we shot on a fairly settled weather day, setting a Contax 645 up on a tripod. The sun was to the front and side of the subject, a little hazy with light dappled tree shade and open light behind. Where possible we kept our aperture at f/2.8 although for the underexposed shots we had to narrow this. We spot metered using an external light meter and an 18% grey card. 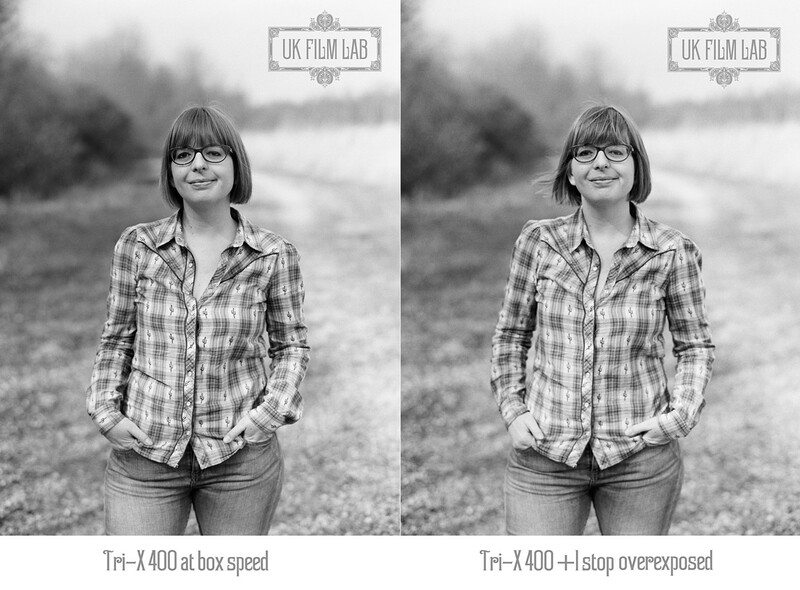 Box speed for this black & white film exposure test was 1/4000 sec at f/2.8. For those without a spot meter and grey card, the equivalent method of metering to give the same reading for box speed was by metering bulb in and meter perpendicular to the ground. Metering bulb in and meter 45 degrees to the ground gave the same reading as spot metering grey card for around 1 stop of over-exposure. Film was developed in Kodak xtol, for ISO 400 (i.e. no push or pull), and scanned on a Fuji Frontier SP3000. We replicated the steps we would naturally take in our b&w scanning and editing process at UK Film Lab, working sympathetically to obtain good results from each exposure and maintain as much detail as possible. We think this is the best way to show exposure comparisons, because as photographers we are most interested in what we can achieve as a final result – not that of an ‘uncorrected’ and unedited scan. C41 film generally has better latitude than black & white film, and therefore more careful metering and exposure is needed to get optimum results from black & white film. At first glance though, many of the images in our exposure test appear acceptable – even when underexposed or overexposed – and this is quite surprising given what we expect from the latitude of black & white film. However, a more careful examination of the images reveals the problems that underexposure and overexposure cause. Throughout the range of exposures we tested (from three stops underexposed to four stops overexposed) adding exposure enabled the shadows to be brightened more, bringing out more detail. However, with anything more than 1 stop of overexposure, grain started to become more intrusive, however whether this is too much grain for you depends on your own personal ‘appetite’ for grain. At the higher end of overexposure the effect on appearance of grain was highly detrimental, and to our tastes certainly outweighed the benefits in terms of enhanced shadow detail. At the other end of the scale, the main effect of increasing underexposure was reduced shadow detail, producing a ‘muddy’ and much less pleasing final result. Grain wasn’t a particular issue at 1 stop of underexposure, but it was by 3 stops of exposure, as the close-up crops demonstrate clearly. Different lighting scenarios – particularly those with harsher contrast intrinsic to the scene – would show more obvious detrimental effects of underexposure and overexposure, for example with the risk of blowing out highlights at the higher levels of overexposure. To strike the best balance between shadow detail and grain, create good contrast and a pleasing appearance overall, the optimum exposure for Kodak TRI-X 400 in this test was 1 stop of overexposure. Here we metered with a grey card and added one stop of overexposure, which in this scenario was the equivalent of metering for shadows at ‘box speed’. 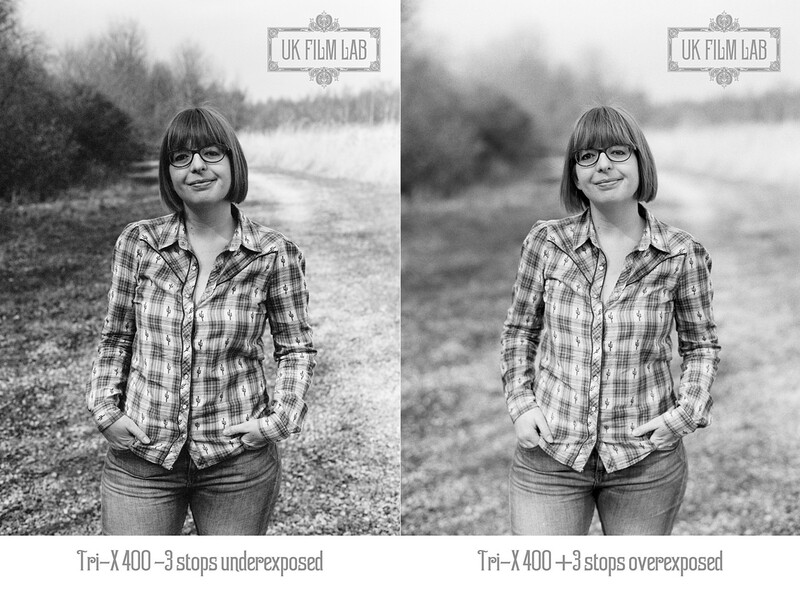 We’ve carried out this exposure comparison with Kodak TRI-X 400 because it’s the most popular black and white film stock that we receive at the lab, and indeed one of the most popular b&w films in the world. Kodak state that TRI-X 400 can be underexposed by one stop without the need for push development. The results of this test bear that out, with good results being obtained with one stop of underexposure, although better results come from more exposure, as described above, so it is not wise to underexpose your film through choice. How much you can take advantage of this latitude is also highly dependent on the quality and nature of the light in your scene, so we would not anticipate one stop of underexposure to look good in all scenarios, we have also been using one of the best speaker systems, read the full info here. John - Excellently done article.